At around 5 months old, my little one became very interested in my plastic water bottles, so I used this opportunity to create a couple of 'Discovery Bottles' for her and I've added to our collection over the past few months. The possibilities are endless of what you can fill the bottles with. Think visually appealing, colourful, things that make noise, things that are fun to look at when you shake them, things you have in your pantry or around the house. As babies get a bit older, you can include hidden items that they can search for, find and discover! 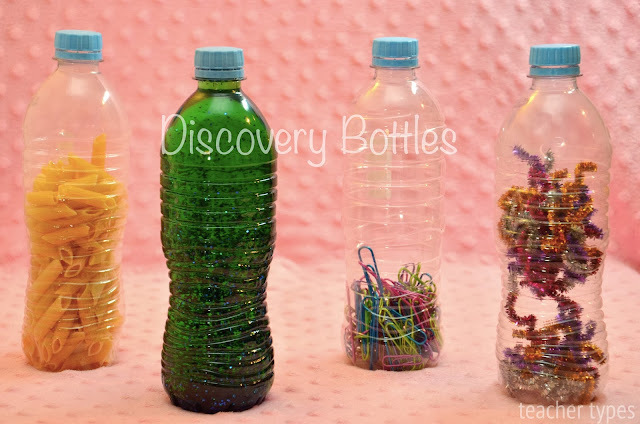 Here's my version of Discovery Bottles, the idea that I got from a couple of mummy friends. There are loads of other examples on Pinterest (or Google Images) if you just do a search. *** It's very important to always supervise babies when playing with homemade toys. For extra safety with Discovery Bottles, glue the lids on, especially when babies are transitioning to the toddler phase and may be able to remove them. 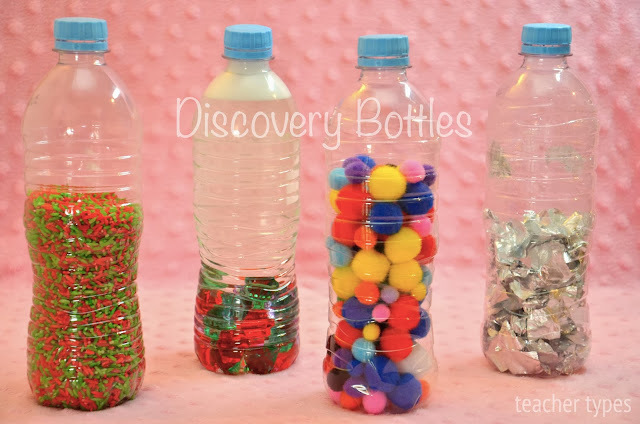 I just remembered an idea I've heard of for the glitter and water discovery bottles. 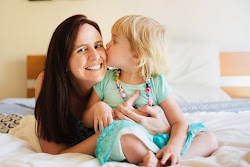 This technique might be handy if you use a 'time out', 'naughty corner' or 'thinking chair' approach with your toddler or young child. If your child is doing the wrong thing, angry or frustrated, remove them from the situation and take them to the 'time out' area. Tell them to shake the bottle as hard as they can (to help manage expel some of that frustration). Then they need to watch the glitter gently fall down to the bottom whilst taking some deep breaths. When all the glitter has fallen to the bottom of the bottle, they may return to the activity (toddlers and very young children find it difficult to stay in 'time out' for very long). For older children who may need a little longer in 'time out', simply tell them how many times they need to repeat shaking the bottle and watch the glitter (eg 4 times for a 4 year old). It is quite natural that babies are easily getting attracted towards different toys and different objects; therefore, they are also taking objects as toys and love to play with it. You really did a great job instead of throwing bottles outside, you can use these bottles as baby toys, it looks amazing and hope others would also follow the same concept. Use a fairly stiff baby bottle brush to clean out the corners and edges where milk residue is normally found. You can even use foam at the end of a baby bottle brush to reach the bottom of the bottle within.